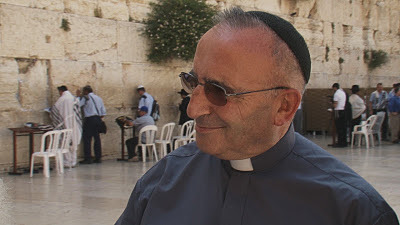 This extremely interesting documentary follows Catholic priest Romuald Jakub Weksler-Waszkinel, who discovers that he was born to Jewish parents in Poland during the Holocaust. Waszkinel is drawn to the State of Israel and his Jewish heritage, which prompts him to come live on a religious kibbutz. His request to leave on Sundays to go to church is denied, as is his citizenship request, which forces Waszkinel to struggle with the disconnect between his two faiths. The thing he finds most difficult to let go is his love for Jesus, since he claims that Jesus always loved the Jews, and was a Jew. The film includes a moving sendoff for Waszkinel as the nuns at his church bid him farewell and good luck, and his multiple visits to Yad Vashem are all very powerful. The subject matter is very enticing, and this exploration of his character and his religiousness doesn’t disappoint.